Discover how a unified ERP and CRM solution, specifically tailored to the unique requirements of the high tech industry, can provide your company with better visibility and control. 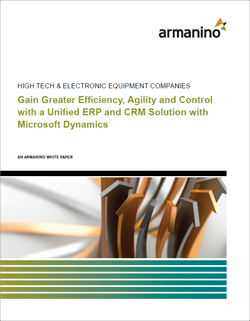 Microsoft Dynamics AX and CRM are uniquely positioned to optimize and unify your front and back office processes. To obtain a copy of this white paper for free, fill out the form below and it will be emailed to you after submission.